Why does steam make bread light and crusty? It slows down the cooking process. 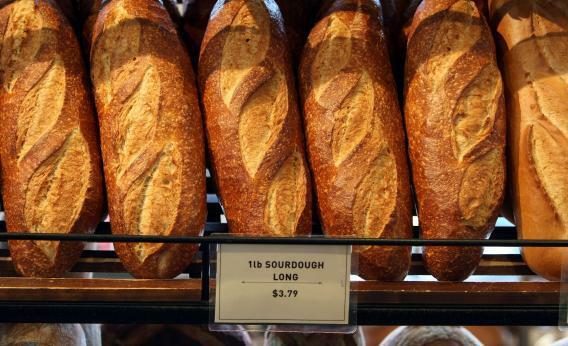 Food Explainer: Why Does Steam Make Bread Light and Crusty? If you’ve ever made baguettes at home, you’ve probably tried to ensure bakery-style results by brushing the unbaked loaves with water, spritzing a fine mist directly into the oven, or pouring boiling water into a pre-heated pan at the bottom of the oven. Why does humidity make yeast bread voluminous and airy and give it a golden, crackly crust? It slows down the cooking process. When a loaf bakes, a crust forms due to a couple of processes. Moisture evaporates from the surface, causing the uppermost layers of dough to dry out and become rigid, and gluten—the elastic, protein component of the dough—coagulates (i.e., its molecules bond to one another to form a solid structure). Humidity delays these processes, which then delays the formation of the crust. Add steam to the oven, and the vapor will condense on the cold, raw dough, leaving a film of water on the exposed surface. This additional moisture absorbs some of the oven’s heat, thereby lowering the dough’s surface temperature. This in turn slows down the dehydration process and prevents the gluten from coagulating too soon—both of which keep the dough flexible for longer. Why is a flexible surface so important? In the first ten minutes of baking, bread rises significantly in a process known by bakers as “oven spring.” This is caused by three factors. The first is that the yeast in the dough undergoes a final burst of fermentation, producing bubbling gases (before it dies at 140°F). The second is existing gas bubbles in the dough, which expand when the temperature rises. Finally, the heat transforms any dissolved carbon dioxide in the dough into gas molecules. If a crust forms early on, it restricts the dough’s expansion—but keeping the dough’s surface supple for as long as possible allows it to stretch to its maximum volume, resulting in a light, airy loaf. Steam also helps produce a really crisp crust. When the surface of the dough reaches 180°F, the starches in the slowly forming crust start absorbing moisture. They eventually become so saturated that they burst and liquefy. As the bread continues to cook, this starch gel turns into a brittle and glossy shell. The more moisture there is on the surface of the dough, the more abundant the starch gel, and the crisper and more crackly the eventual crust. Steam plays a hand in crust color, too, and prevents it from burning. When the crust hits 275°F, its sugars start to caramelize, contributing color and flavor. Between 302°F and 401°F, the crust browns even more thanks to a process called the Maillard reaction in which sugars and amino acids react with each other. Since steam prevents the surface temperature from getting this high too early on in the baking process, the inside of the loaf has time to cook through without risk of the crust becoming too dark. With crust formation delayed, the end result is also thinner than it would be if there were no steam. This is a good thing, because a thin crust is more porous, so when a freshly baked loaf cools down, steam from within can pass straight out through the crust, which preserves its crispness. With a thicker, more impermeable shell, however, the vapor gets trapped inside the loaf and condenses, making for a disappointingly limp crust once the bread is cold. From all this, you might think steam is a cure-all for most bread-baking maladies. But skip the mist if you’re making bread that contains fat, eggs, dairy, or sugar, like brioche or challah. These extra ingredients raise the temperature at which starch gelatinizes which in turn delays the formation of the crust, essentially achieving the same characteristics as steam. Food Explainer thanks Paula Figoni, associate professor at Johnson & Wales University and author of How Baking Works, and Ciril Hitz, author of Baking Artisan Bread.